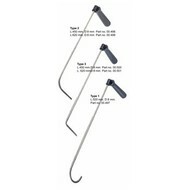 PDR Door Tool Kit: Adjustable tool kit 3 pcs. The multi adjustable handles allow the technician to quickly change the working position angle. Just one simple click, and the tool is ready to operate in the new angle. The steel is our standard specially heat treated, 8 mm, durable stainless steel.